Monique Laurent opens the World Women in Mathematics event in Rio. Picture: ICM2018. 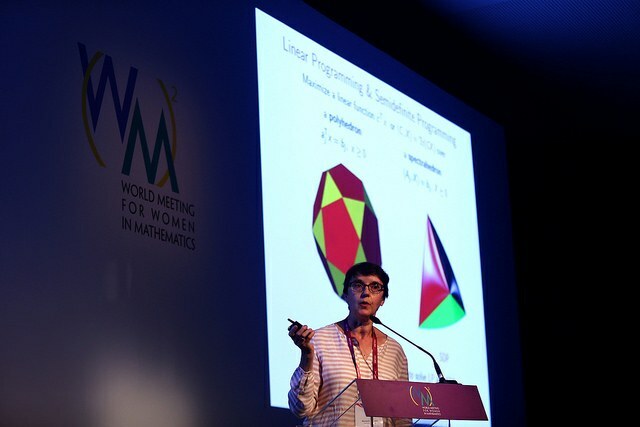 CWI mathematician and computer scientist Monique Laurent opened the World Women in Mathematics event (WM)² in Rio de Janeiro on 31 July with the keynote lecture 'Convergence analysis of approximation hierarchies for polynomial optimization'. The daylong satellite event (WM)² united women mathematicians from all over the world and preceded the International Congress of Mathematicians, which took place from 1-9 August. Monique Laurent’s lecture was based on work with Etienne de Klerk (Tilburg University and Delft University of Technology) and focused on hierarchies of upper bounds, discussing recent results about the convergence rates of these hierarchies. 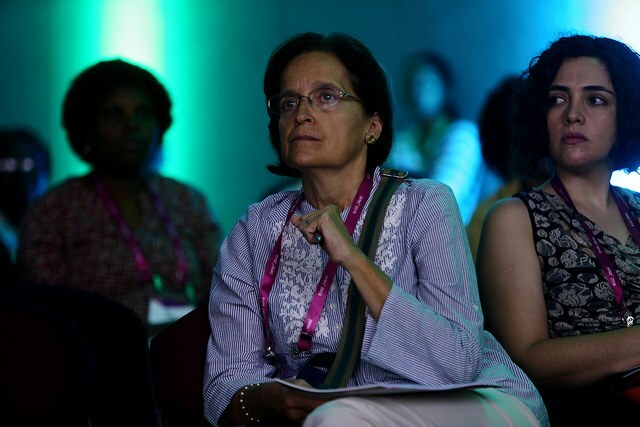 Celina Herrera, computer science professor from the Federal University of Rio de Janeiro, attended the opening lecture. She pointed out that research in this area of computer science is very strong in Brazil and in Latin America, saying it’s "inspiring" to have Monique Laurent here in Rio. They last met at an event in Europe six months ago. "Her lecture and her research, which is brilliant, brings a great contribution to our area." Visiting professor Adenik Adeneji from the University of Abuja was most impressed with the findings presented this morning, and said what she heard could significantly help with an area of research she is currently working on. Monique Laurent highlighted the importance of young female mathematicians having a professional network when starting their careers. "The idea of having a network is very important. It’s very touching to be part of this community. It brings me great joy to be here, as part of this big family." Monique Laurent is a member of the CWI management team since 2016, having led the Networks and Optimization research group at CWI from 2005 – 2016. She is also part-time full professor at the Department of Econometrics and Operations Research at Tilburg University since 2009. She was an invited lecturer at the 2014 International Congress of Mathematicians in Seoul, South Korea.